As the F1 season enters it’s annual summer break, Sebastian Vettel looks poised to collect his 4th straight drivers title, but as Lewis Hamilton’s great victory in Hungary showed, it’s not in the bag yet. The Adrian Newey, Sebastian Vettel has literally been unbeatable in the F1 paddock. The triple world champion has 29 victories, 38 Pole Positions and 52 Podiums in his 5 years with the main Red Bull Racing team. With a 38 point led here in 2013, he is still the commanding favorite to win another championship. However, like in 2012, he must continue his success without having the far and away better car. The Mercedes has seemed to sort out their tire issue and with that, may have the best car in the 2nd half of the year. Vettel needs consistency, and must hope that Mercedes isn’t actually doing as well as they look. Of course that’s not to count out what Red Bull themselves will turn out. At this point last year Vettel was in 4th and turned it on, winning 3 races in a row and squeaked out a 3 point championship win over Alonso. 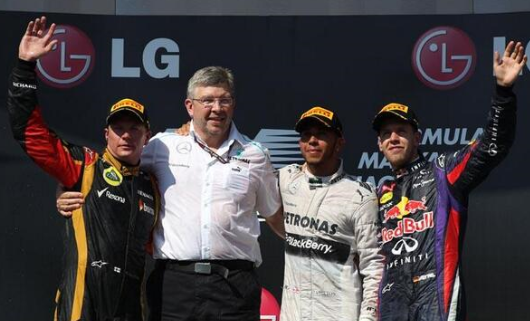 Yes, this is out of order as Lewis is actually, as stated above, 4th in the Championship. However, he is considered the likeliest threat to Vettel at this point in time. The move to Mercedes from McLaren has to be seen as a godsend for the Brit, as the McLaren has absolutely been putrid. The team only have 57 points compared to 208 for Mercedes so far. Hamilton earned a 3rd pole in a row at Hungary and was finally able to turn that into success as he claimed his first GP victory at Mercedes. The Pole position was Hamilton’s 4th Pole of the year and the 7th for Mercedes on the season. They have won 6 of the last 7 Poles, the lone one being Vettel in Canada. So you can see how fast the Mercedes has been this season, but unfortunately have been killed by very bad tire wear on their cars. With a great victory last weekend at Hungary in very hot and humid conditions, it would seem that Mercedes may have figured out their problems with Pirelli tires. There will always be the controversy with their mid-season tire test, but at this point, it seems well worth it for them. Hamilton is 48 points out, but Mercedes could dominate the 2nd half of the season if their pace and improved tire wear continue. As we seen with Vettel last year, drivers can still make up plenty of ground and get the drivers championship. Lotus Team Principal Eric Boullier said it perfect when he rated Kimi’s driving this year as 10 out of 10. Kimi has done an amazing job at a team that’s usually on the fringe between the great big teams and the mid-pack cars. The Finn took the opening round at Australia as had been a model of conisitancy with 5 2nd place finishes and not one race out of the points. Kimi has absolutely been fantastic and has punched above his weight since he’s been with the team. A potential move to Red Bull, to replace the retiring Mark Webber has a lot of people, including myself, excited about what kind of battle it would be. Seeing Kimi’s drives my opinion would have to point to him, but that’s not until next season, so I digress. Kimi posted solid results last year in the upcoming races, so he will certainly be here right in the middle of the championship. With Hamilton entering the fray though, he is going to need to take a few wins away from the duo in the 2nd half, if he wasn’t a legit shot at the title himself. Otherwise, Kimi should have another great high finish at Lotus. No ones stock took a worse hit in Hungary than Fernando. First the media jumped on the story that some of Alonso’s Management was seen talking to Red Bull for the #2 seat for 2014. Also not shockingly, Alonso’s quote, saying as a birthday present, “I would like the same car as the others” didn’t sit well with the Ferrari bosses. Alonso’s frustration has to be mounting as the Italian automaker has yet again not turned out an elite car for Alonso and although he has 2 victories this season, it seems as if year 4 with the Scuderia will end as the others have, close, but with no championship. Still this is Alonso and Ferrari, they shouldn’t be counted out. Alonso did get a podium in 7 of the 9 races coming up to end the season, so if Ferrari can make the improvement, Alonso should be capable of taking advantage. F1 is always full of drama, it strives on it. The 2nd half of the season should be a great one. The F1 circus ends it’s summer vacation at the end of August with a trip to one of the greatest tracks in the world, Spa-Francorchamps on August 25th and follows 2 weeks later at legendary Monza in Italy. Also don’t forget that the 2nd Annual US Grand Prix, the penultimate race, at the Great Circuit of the Americas could help decide the title. Don’t forget to turn into NBC Sports here in the States, or you’ll miss a great time.